Most of the time, Nick goes along with whatever I plan to make as long as we have meat every so often and there’s cheese in the fridge. It’s a convenient arrangement for both of us, because he eats what he is given and mostly likes it, and I get to make whatever I feel like and if I don’t feel like making anything at all he picks up the take-out. We never really dated, because we were in a program at UBC where we were together for pretty much all of our classes and we spent a lot of our between- and after-class time together as well, and before I knew it, he had moved in. Literally. He was just there all the time, and then at last he brought his stuff and started paying rent. I would feed him, and he would clean my apartment while I was at work. It was the best arrangement ever as far as I was concerned, and a boost to my ego that he liked everything, every single meal I served him. After a while I began to suspect that he was full of it. And then one day I made him macaroni and cheese and thought it would be great with kirsch mixed into the sauce, like in fondue, so I added half a cup. It was a year before he’d try homemade macaroni and cheese again. Now we pretty much eat what I feel like eating, because when left in charge Nick does not make choices that support a well-balanced diet. But on occasion he’ll get an idea in his head and depending where we are in the two-week stretch between paydays it can become significant, and he will mention every time I’m chopping up whatever we’re having for dinner that he’d really like venison burgers or mushroom Shepherd’s Pie or calzones. Most recently, the idea in his head has been shrimp and grits, though I haven’t a clue where it came from. 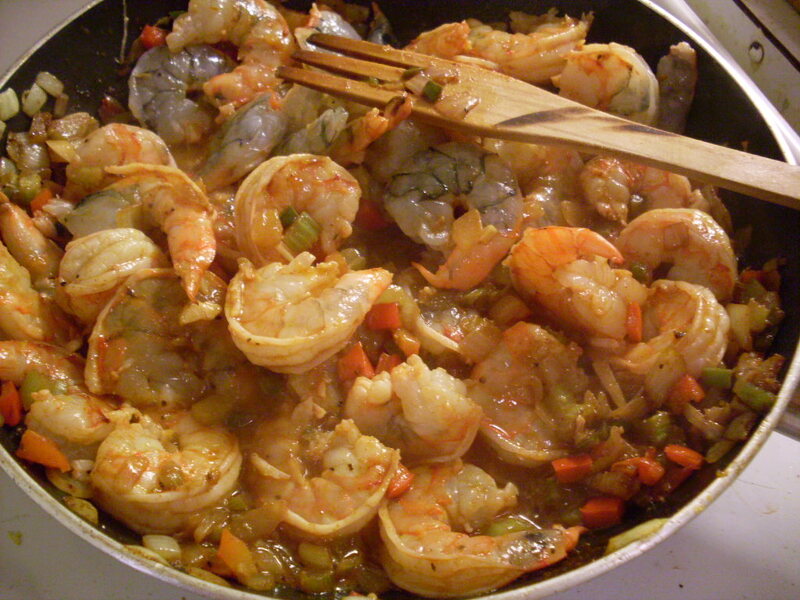 Shrimp and grits takes approximately 10 minutes to make, start to finish, if your shrimp are ready to go. It’s a very good weeknight meal – spicy, satisfying, and brightly coloured – and because it’s served in a bowl it makes the perfect dish for eating on the couch while watching holiday movies or reruns of The Office. 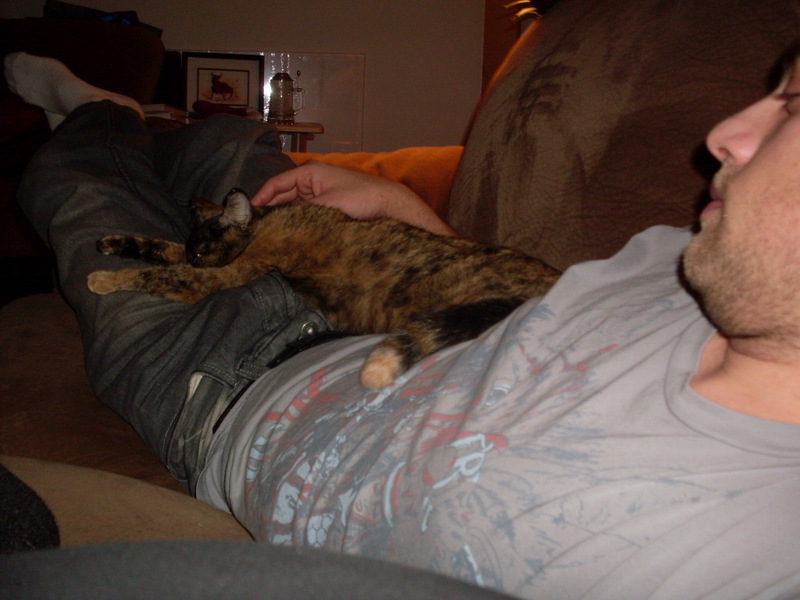 You will know the dish is successful by the grunts of pleasure at the other end of the couch. In a large skillet over medium-high heat, melt butter with olive oil and add onion, celery, bell and jalapeño peppers, and garlic, and lemon zest. 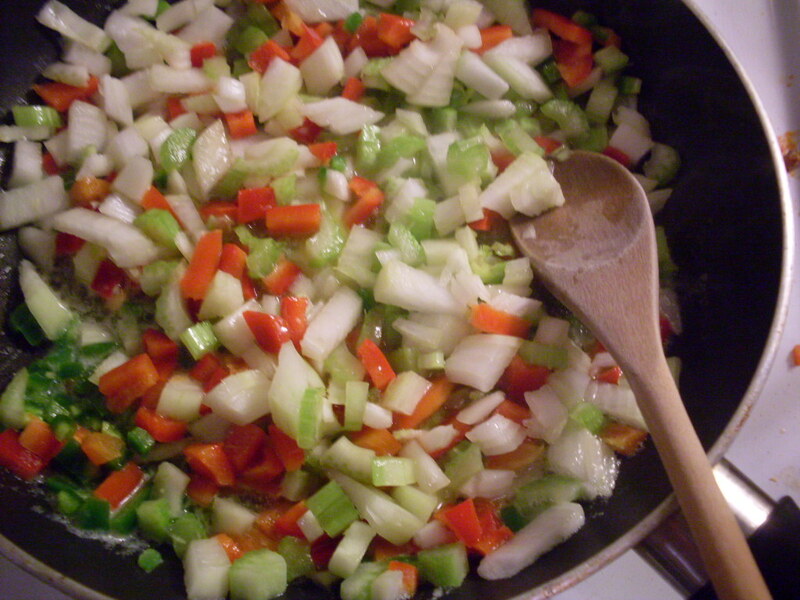 Sauté until veggies begin to sweat, then add paprika, chili powder, and cumin. Meanwhile, bring chicken stock to a boil. Reduce heat to medium, then slowly whisk in corn grits. 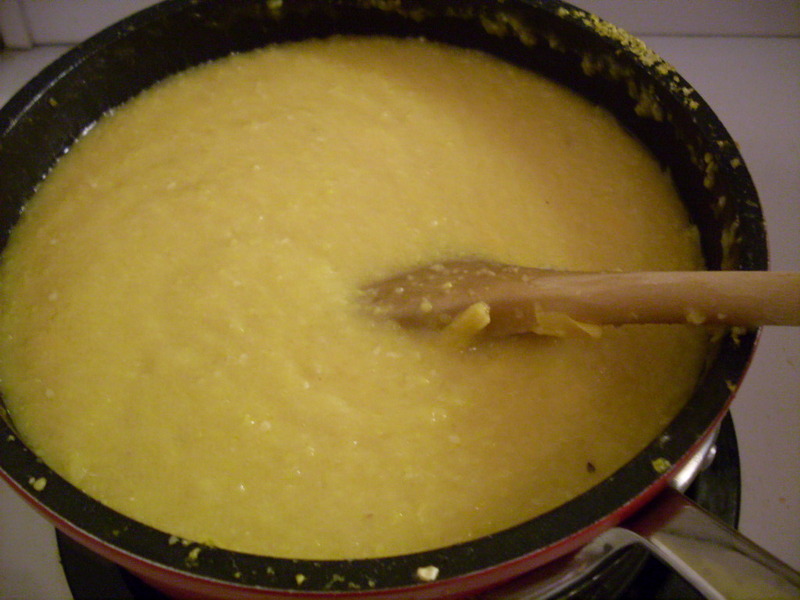 Cook until thick, about five minutes, stirring regularly to prevent the grits from sticking to the bottom of the pot. As grits thicken, add the shrimp to the pan, then the lemon juice. 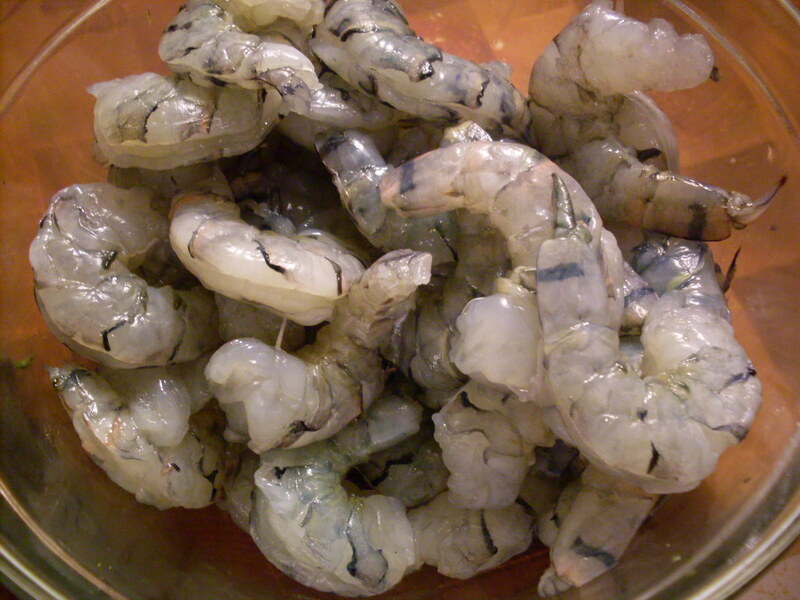 Depending on the size of your shrimp, you will have one to three minutes before they’re cooked; move them about the pan fairly quickly, and remove from heat when they turn pink and opaque. Add parsley. Meanwhile, add butter and cheese to the grits and stir until smooth. 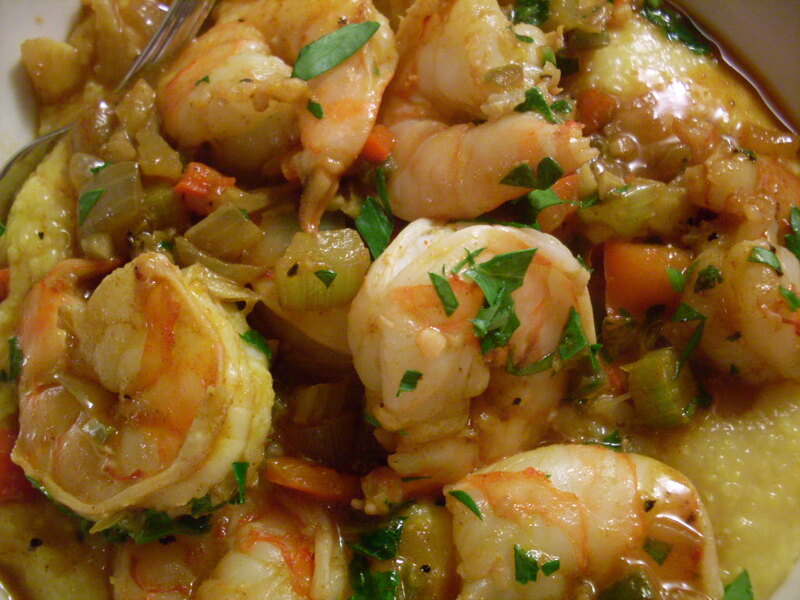 Serve shrimp mixture over grits in a bowl. < Previous Cauliflower macaroni and cheese. 1/2 cup kirsh? in your mac and cheese? that’s one hell of a cream sauce, baby. I think it might slow me down on the mac and cheese too, but it makes me respect you even more. Oh, it was vile! Tasted exactly like nail polish remover. We could taste it in our sinuses, it was so bad. Now I just stick to extra cheese in the cream sauce. Yes to the shrimp and grits! It’s in nearly every restaurant here in S. Ga. My favorite version makes a grits cake (you make the grits, pack in in a loaf pan to chill, then slice and fry it) and a creamy cheese (almost alfredo but not quite) sauce. I’ve never met a shrimp and grits I didn’t like. Ooh! I’ve had that here, but they call it polenta fries. Delicious! Looks amazing! Oh, grits. I love cornmeal-based anything and I’ve yet to master the art… thanks for the inspiration. And satisfactory grunts across the couch while Office reruns play: you’re a girl after my own heart. haha i think you just enlightened me as to why most of my meals are also served in bowls- that being the comfort factor of being able to balance a bowl on your knees while sitting cross legged on the couch, catching up on tv shows. Love grits so much. 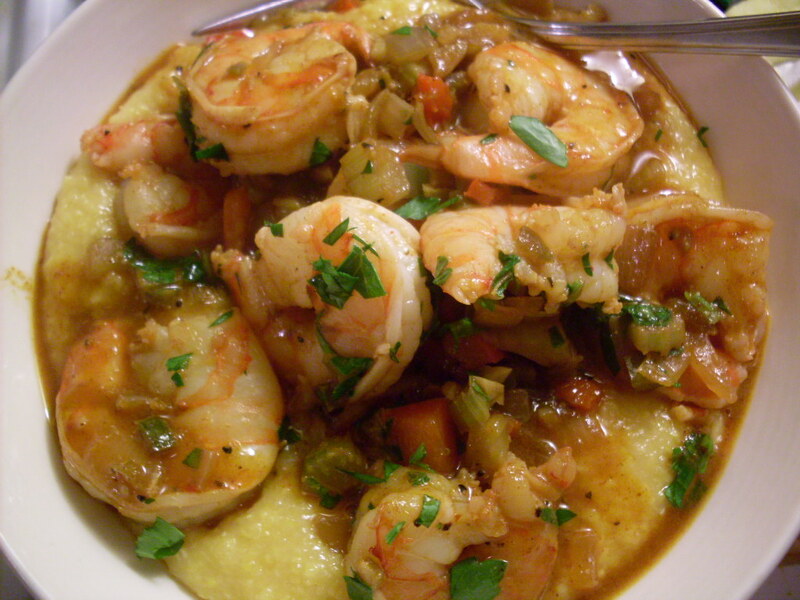 I’ve been wanting to try shrimp and grits for a long time now, ever since I had some of the fabulous stuff down in Charleston, SC. Thanks for reminding me and for the inspiration!